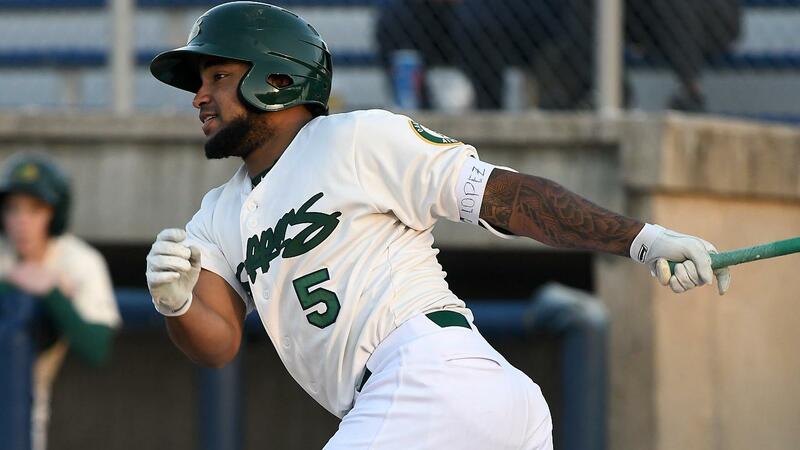 A grand slam in the ninth inning by the Clinton LumberKings (39-31) boosted the away team to an 8-5 victory over the Beloit Snappers (32-37) at Pohlman Field in front of 1,195 spectators. It was the final game of the first half for the Snappers, who dropped just their third game of the season when leading after eight innings. With the bases loaded in the ninth, two outs away and the Snappers on top 5-4, Clinton cleanup hitter Ryan Costello blasted his second home run of the game over the center field wall off Seth Martinez. It completed a comeback for the LumberKings, who trailed 4-1 after the third inning and scored seven runs in the final three. Costello tied the game in the eighth inning, with the Snappers up 4-2, on a two-run homer over the right field fence. For Costello, he finished the series with three home runs as he now heads to Lansing, Michigan to participate in the Midwest League Home Run Derby. The Snappers took the lead in the bottom of the eighth on a Jesus Lopez infield single that scored Hunter Hargrove to take a 5-4 lead. Lopez finished the game going 2-for-4 with two RBI. His first RBI came on a solo home run in the second inning to left field to give the Snappers a 3-1 lead. It was his team leading eighth homer of the season. Forgotten in the Snappers unfortunate end was right-handed starter Mitchell Jordan. Jordan tossed his fourth quality start of the season, going six innings and surrendering just one run on four hits. He struck out a career high eight batters as well. Hunter Hargrove got in on the action in the first inning, with his fourth home run of the season that drove in Austin Beck to take a 2-1 lead. Hargrove also doubled home Trace Loehr in the third to go up 4-1. Hargrove finished a triple shy of the cycle. Getting the win for the LumberKings was Scott Boches, who tossed two frames late. Collin Kober came on in the ninth and retired the Snappers in order to earn his third save of the season. Seth Martinez took the loss. Logan Farrar singled in his third at bat, extending his career-high hitting streak to 15 games. He is now tied with Hargrove for the second highest streak this season by a Snapper. Jordan Devencenzi holds the title with 19 games. The Snappers will now head into the All-Star break. Beck, Loehr, Wyatt Marks and Xavier Altamirano will be the four Snappers representatives at the All-Star game on June 19th. On Thursday, June 21st, the Snappers will return from the break on the road at Quad Cities. Their next home series will be June 28th-30th against the Peoria Chiefs.